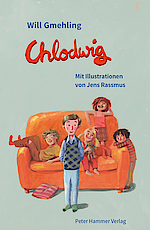 If the new kid at school is called Chlodwig, then he is bound to have a hard time. And if, on top of that he wears his hair parted and polished shoes, he is most likely brilliant at maths, but absolutely no good at playing football. And that‘s exactly how it is with Chlodwig. The fact that the new kid is to sit next to Bert, who has so far had a desk to himself (and for a good reason), gets this story started. Bert has neither a hairstyle, nor clothes that are in one piece. At Bert‘s house, there is chaos; his family is romping around, arguing, laughing and sometimes the power is turned off. When his parents have to travel, Chlodwig makes it clear that he would much rather stay with Bert than with his parents’ friends, whose house is as big, quiet and clinically clean as his own. Bert is quite sceptical of this idea and Chlodwig’s parents even more so. But Chlodwig has decided: He’s going to move right into the hullabaloo of Bert‘s home! (c) mundt agency, Anja Mundt. All rights reserved.